Bear with me now: Scooby Apocalypse isn’t that bad. Actually, it’s kind of…good. 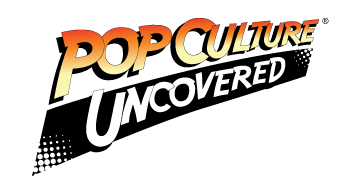 We all reflexively feared the worst when we saw DC’s revamped lineup of classic Hanna-Barbera cartoons and Scooby Apocalypse in particular, almost as if it were some kind of world-ending event for which I lack the right word right now. Hanna-Barbera’s cartoons have always been about silly animal characters having the same formulaic adventures over and over, being nothing but repetitive and safe. In an era where many of DC’s books have felt too “mature” for kids, the junior books which stay closer to their cartoony roots remain some of the best titles on the market. So dropping Scooby-Doo into a post-apocalyptic nightmare is, understandably, a little disturbing. Here’s the problem: we’re used to seeing “adult” properties downgraded for kids, but we have less experience with them going in the opposite direction. For example, despite fan resistance to the Teen Titans being converted into its zany counterpart on Teen Titans Go!, the show has become pretty successful, and the older, classic Titans isn’t invalidated in the least. We’ve got things like the Ultimate Spider-Man cartoon and DC Super-Hero Girls and all kinds of other junior properties that work just fine in their own right. So why does age conversion in comics have to be a one-way street? If the Teen Titans can become a junior show for kids, why can’t a kids’ classic be equally upgraded for mature audiences while still acknowledging that the original, iconic version is the default? It’s worked for Archie. Repeatedly. So let’s give “mature” Scooby a shot. Scooby Apocalypse reintroduces us to the classic mystery gang in some not-too-distant future on the eve of a worldwide disaster. This is a literal introduction–I don’t recall the original cartoons ever giving us an origin for the characters–with most of the characters meeting each other for the first time. Scooby’s ability to talk is explained as him being a government experiment, and Shaggy is his trainer who’s trying to help him be a tougher dog. Daphne is a C-rated mystery-solving journalist who’s trying to become relevant again, with Fred as her overzealous cameraman (whose affection towards Daphne is unrequited). The biggest change is to Velma, who’s upgraded from “nerdy bookworm” to pre-apocalyptic scientist. She’s involved in a secret government project to pacify the world through infectious mind-controlling nanites. Her sense of ethics convinces her to bring the Scooby Gang together for the first time, hoping to expose the project before it’s activated. Unfortunately (or coincidentally, perhaps? ), the gang is locked down in the project’s airtight bunker when the nanites are activated early. So the newly-formed mystery gang will have to sit things out while the world turns into…what? The issue’s cliffhanger gives us glimpse of what’s to come. If that’s not enough, the issue includes a bonus backup tale of how Shaggy first met Scooby and why they’re so close. This is decent upgrade to the Scooby franchise for older readers who want to grow beyond the repetition of crooked real-estate developers dressing as ghosts. These are still the characters we know: Scooby and Shaggy are always thinking of food, Velma’s a nerd, Daphne is vain, and Fred acts before he thinks. And from the looks of the issue’s climax, the gang will still be dealing with monsters, albeit ones more appropriate for the 21st century. In other words, Keith Giffen and J.M. 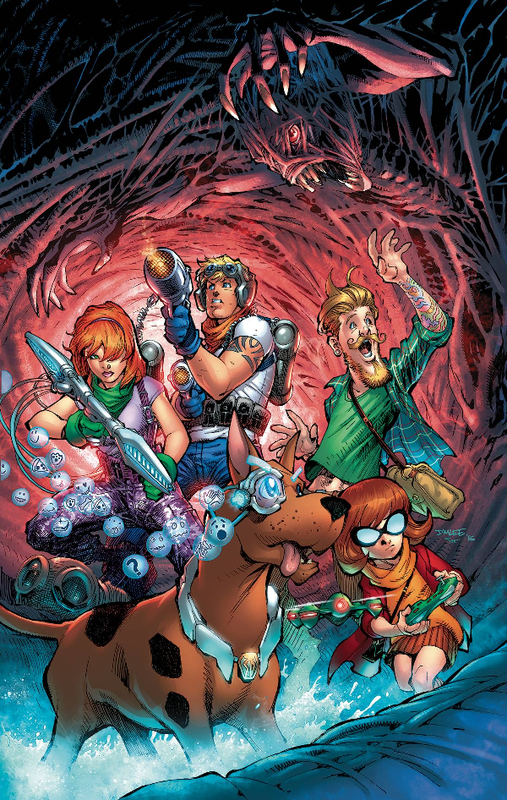 DeMatteis have managed to capture the spirit and voices of the classic Scooby cartoons while still making an authentically new take on the franchise. Also, pay close attention to Howard Porter’s art. The man has not only managed to redesign the Scooby Gang for the 21st century while keeping them familiar (this is the guy who redesigned the JLA in the 1990s), but he’s also clearly having fun with the story. Pay attention to the emojis that come out of Scooby’s glasses, and be on the lookout for a subtle Watchmen reference that’s as cute as it is ominous. Lastly, I’ll say this: I put Scooby Apocalypse to the ultimate test by having my 10 year-old daughter read it. She’s had limited exposure to Scooby, although she reads DC’s Scooby-Doo Team-Up regularly and just watched the newly-released Lego Scooby-Doo: Haunted Hollywood film. Guess what? She actually liked it. She had no problem with an “adult” Scooby and enjoyed the sense impending doom that builds during the story. If a member of classic Scooby’s target audience can enjoy a radically recreation of the character, then maybe adults can too. Consider giving this one a shot. Rating: Five Scooby Snacks out of five.